Key messages from EAPN's 2017 conference: Learning from the past to post-2020 – What EU strategy to fight poverty, social exclusion & inequality? EAPN presents its members’ Key Messages from the 2017 policy conference: Learning from the past to beyond 2020: What EU strategy to fight poverty, social exclusion & inequality? On 15 June, the conference exchanged on the crucial questions of What integrated strategy should the EU propose to effectively fight poverty? and how should this strategy be mainstreamed into a post 2020 strategy? It gave special attention to the SDGs agenda; the follow up on the European Pillar of Social Rights, and the implications of the Future of Europe proposals. 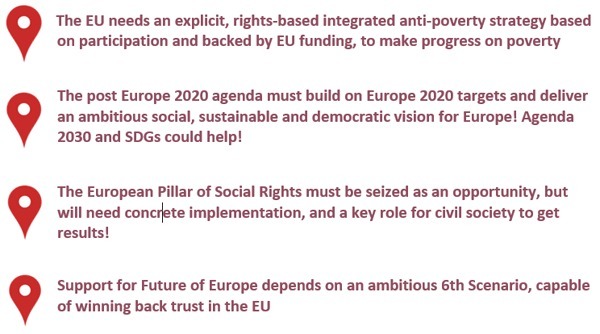 The post Europe 2020 agenda must build on Europe 2020 targets and deliver an ambitious social, sustainable and democratic vision for Europe! The SDGs 2030 agenda could help! The European Pillar of Social Rights must be seized as an opportunity, but will need concrete implementation, and a key role for civil society to get results!